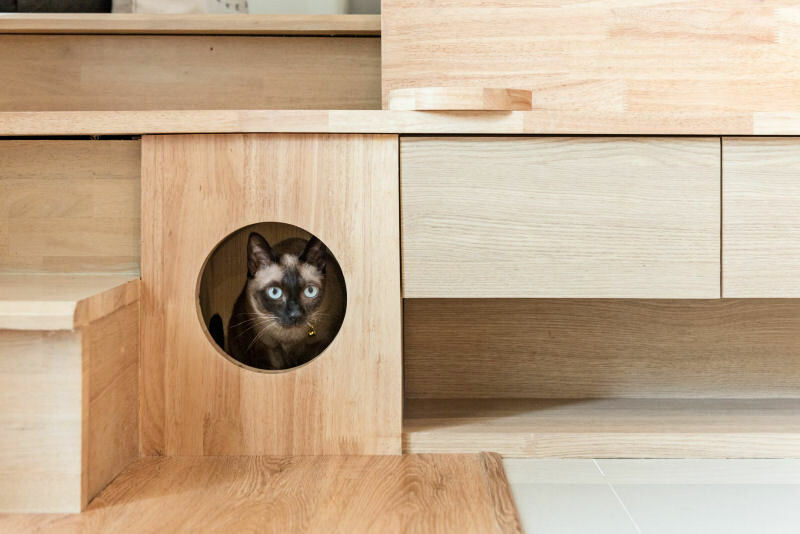 Have you ever wondered how far you might go if you could redesign your home to make it truly cat-centric for your fur babies? 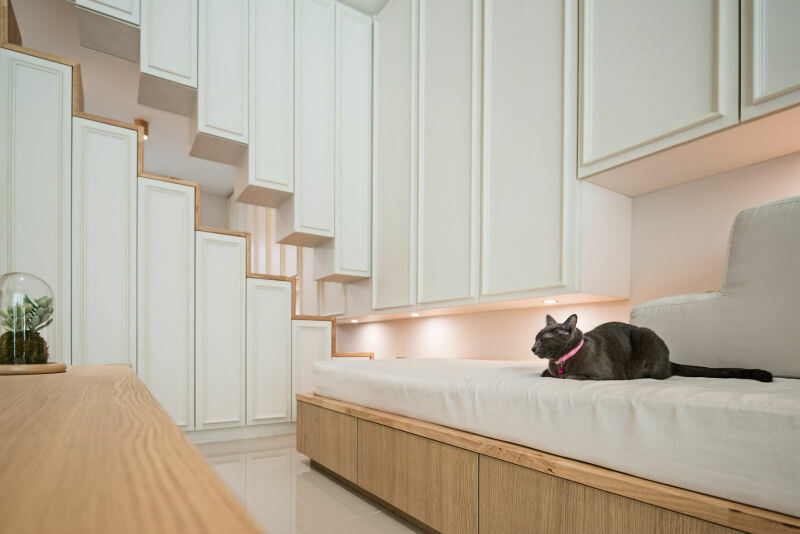 We caught up with chief architect (and owner) Ponn Laohasukkasem of Ponna Studio (an architecture firm based in Bangkok, Thailand) to find out about this amazing project he undertook in 2016 to redesign and renovate a client’s home to optimize function, flow and fun for both the family and more importantly their felines. 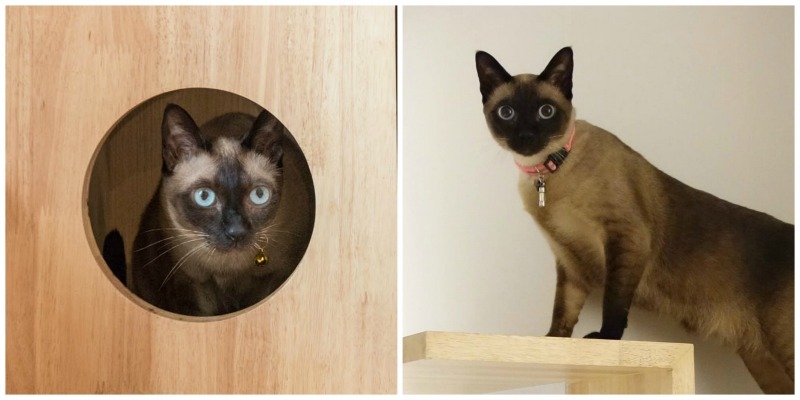 Khun Ming’s 3 cats are original Thai breed cats. Their names are in Thai, so they might sound a little strange to us. 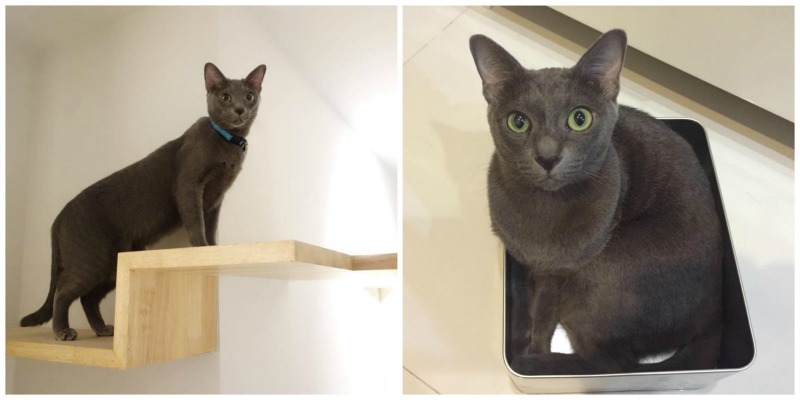 The first cat is named “Koon me” – she is a Korat cat (native Thai breed). The second one is called “Kaew manee” – she is a Wichien- maat cat (also a native Thai breed). His fur color changes with temperature. Lighter when is hot and darker when it is cooler. The third cat is called “Thong lang” – he is a Suphalak cat (another native Thai breed, and one of the the rarest). 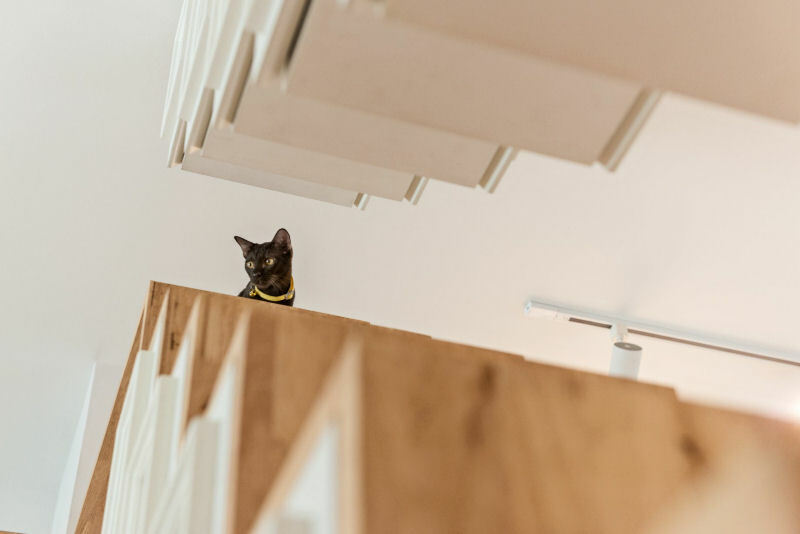 Next we asked Ponn to share with us his creative process in designing these meowvelous renovations and the client’s take on the outcome. Q: How long did the family live in this house before doing these renovations? It’s a new home. The property developer provided only a few basic amenities, and the family wasn’t happy with the given decor. 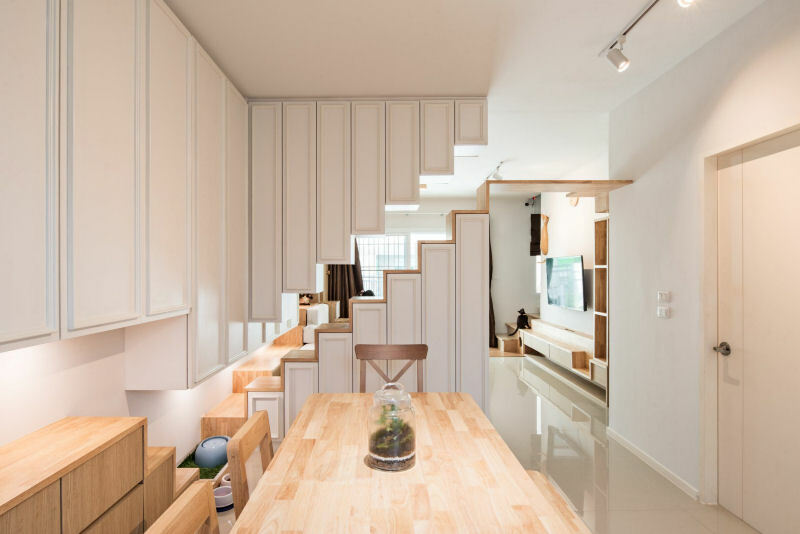 Thus, the owner invited Ponna Studio to renovate and the family moved in after the decoration was finished. 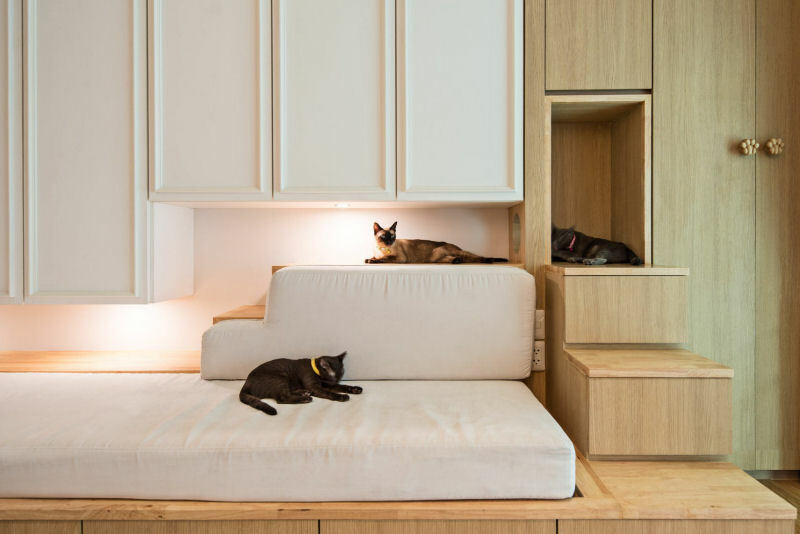 The owner (Khun Ming and her husband) loves cats. They treat them as their own children and their cats are very well taken care of. They spend most of their time indoors with occasional outdoor walks. The house is like a world to them. 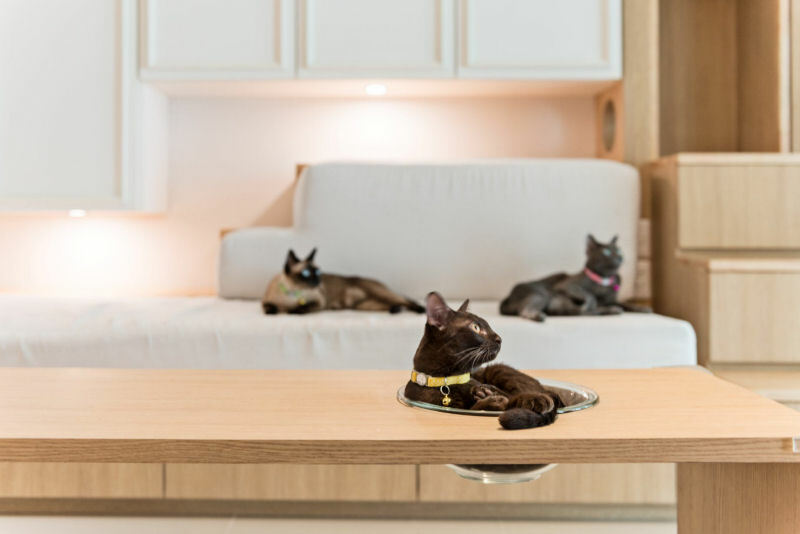 As a result, they want to make their home as wonderful as possible for their cats. 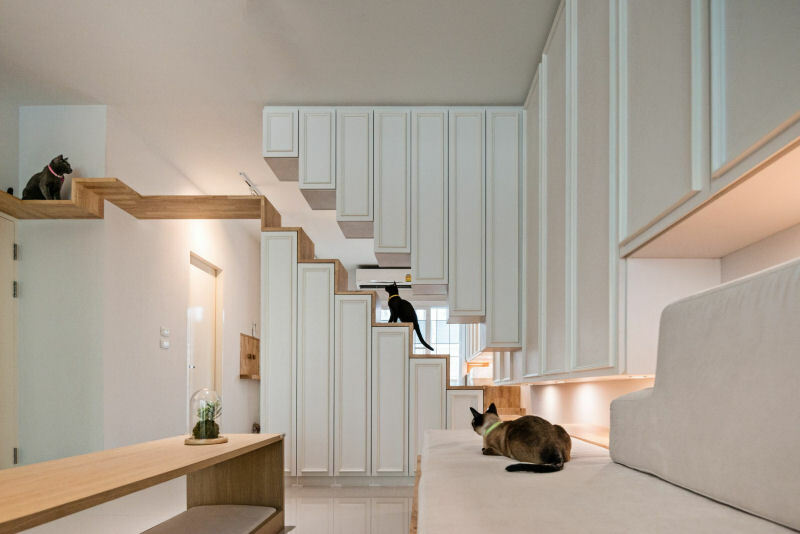 The concept is to construct a house that both owner and their cats can live happily and fully accommodate their needs within the limited space. Moreover, Thai people also believe that cats bring luck. If you treat them well, they will bring luck to you. Q: Is it true your team did ‘movement maps’ of the cats to see where they walked and spent most of their time? Yes, that is true. Part of our work was to spend time studying their movements within the space. We also interviewed the owner extensively, they shared their cats daily routines along with photographs and stories. Then we start drawing each functions and activity line as an overlap layers both occupants. Q: How long did this movement flow mapping take? It took about 2 weeks to design the preliminary concept and mapping the model took another 2 weeks to develop for owner approval. Q: How long did the actual physical re-modelling take? From the design process until construction drawing, it took us 2 months and another 3 months for the construction. Q: Was it everything you hoped it would be? For the owner, she said “it is absolutely beyond our expectation.” After hearing that, we were over the moon. So glad that the owner loves our work. We were super happy of course. Q: What surprised you most when everything was finished? 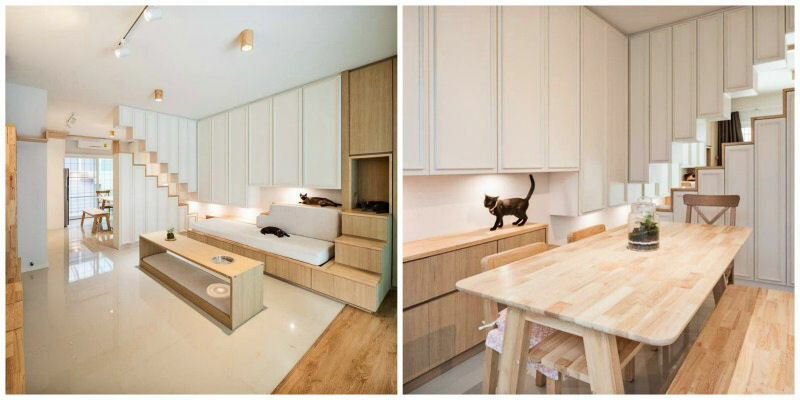 The thing that surprised us the most was how happy the owner and their cats are in the space that we designed for them. The many hours we spent showed us that it was totally worth it. Q: What’s the best thing about the new design? 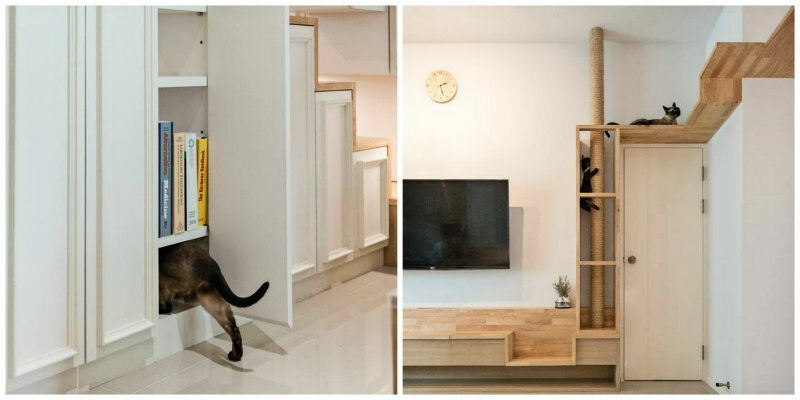 Prior to moving in, the owner and their cats lived in a small apartment, so their cats had a limited space to play. They weren’t used to climbing up or jumping down. Their world was pretty much horizontal 2D. Then, out of the blue, when they first moved into the house, they start scaling up and down, they were truly happy. 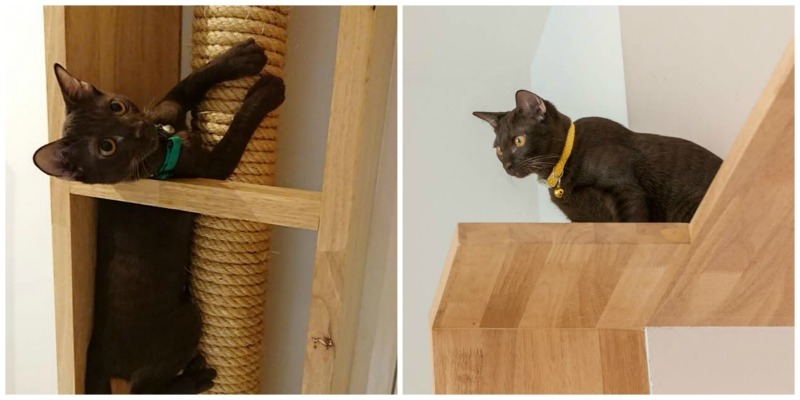 It surprised the owner how enjoyable and how much movement that their cats were capable of doing, at the same time heart warming. If I could do it again, there is one thing we might not do lol. We probably would not have made a hole under the stairs, almost like a tiny cave because the cats love to play hide and seek. They would hide in a this mini cave and jump out when the owner walk pass, most of the time it scares Khun Ming and her husband. 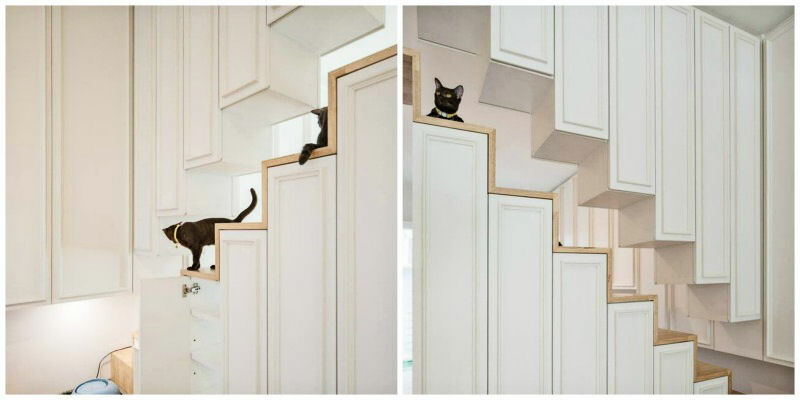 Q: Any advice you can give to cat owners who may be thinking of remodeling their homes? 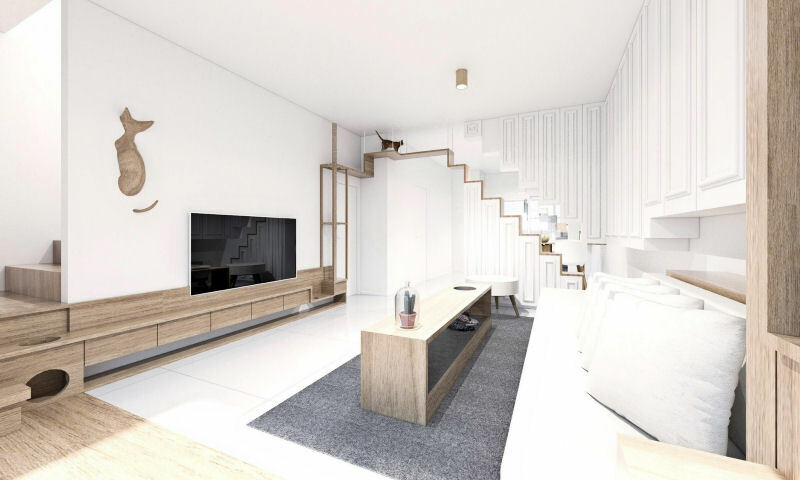 If they would like to design the special home for themselves and their little friends, I’d recommend them to find the cat lover designer who would be more understanding and enjoy the work as same as the owner. 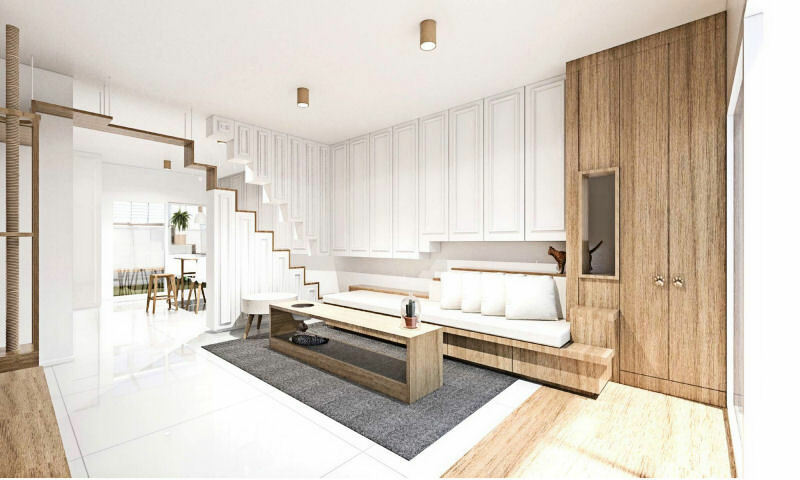 The result will not just a beautiful place but a better home for family. Q: Any other cat-related home renovation projects planned? We had such a good time working on this project, so we hope there are more of this type or similar projects in the future such as cats, dogs or other pet related projects. We would always welcome the opportunity to undertake such a project. 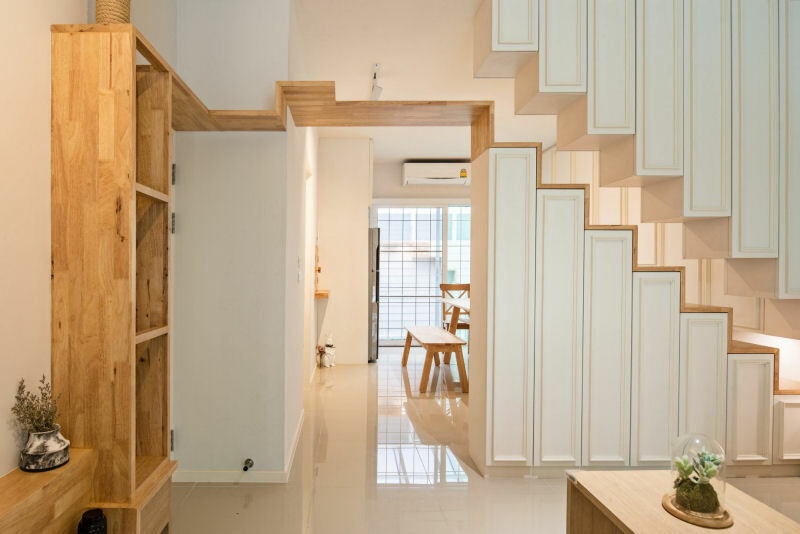 There’s certainly no shortage of play space and chilling quarters in this home. 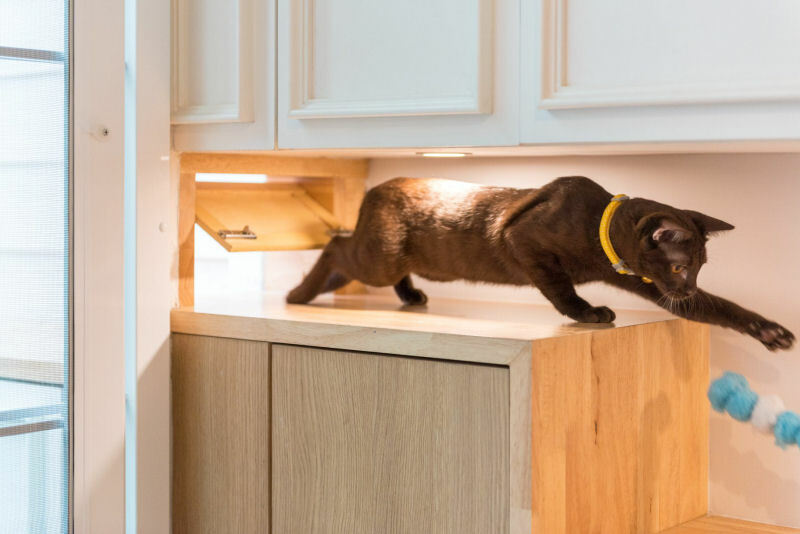 The post Designing a Purrfect Cat-Centric Home appeared first on The Purrington Post.